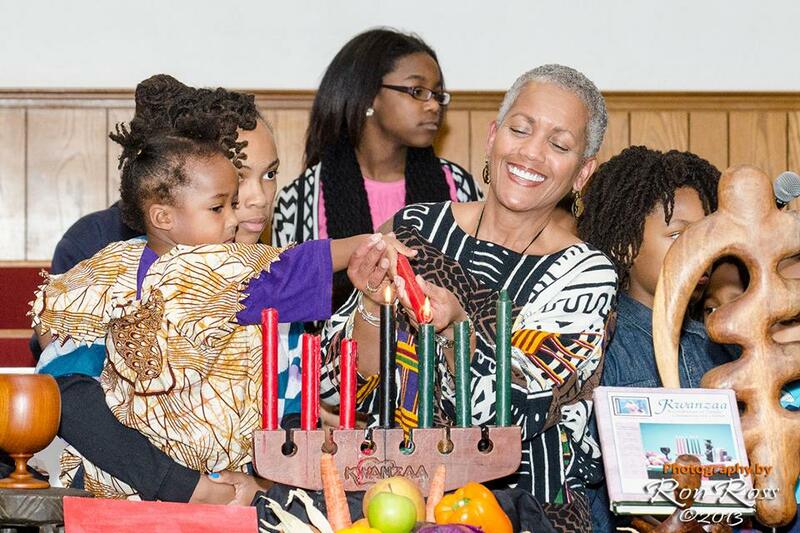 Building community through identifying with our Afrikan ancestry & family-oriented traditions is at the heart of Kwanzaa. From December 26th thru January 1st, Charlotte ceremonies & practices cherish our children, esteem our elders, acknowledge our ancestors & revere our Creator. This seven day annual event series is the result of the shared leadership of individuals & organizations dedicated to the Afrikan philosophy of Kawaida—the need for our people to discover & exemplify the best of our culture, practices, and traditions both past and present. 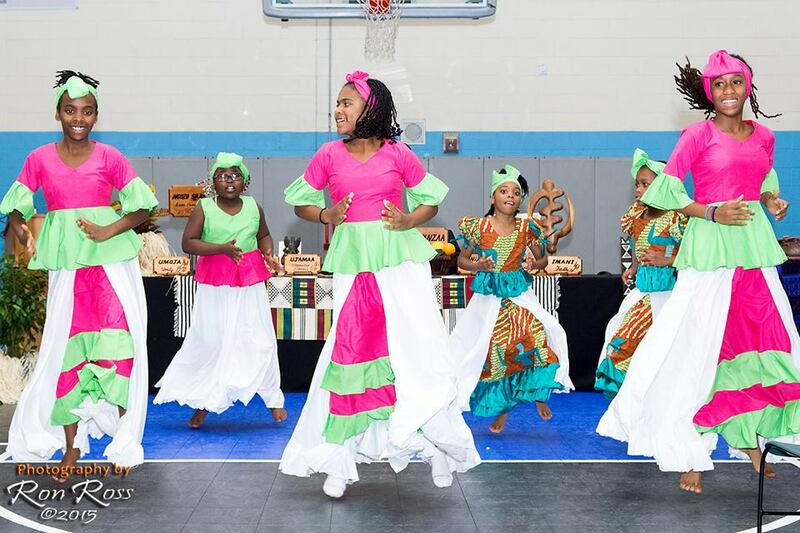 The spirit of Kwanzaa Charlotte is best summarized by the Afrikan term Ubuntu which means “I am because we are”. Each day families & individuals are reminded to incorporate the values expressed in the Nguza Saba into their life. Day 1: Umoja = unity; oneness of our people, our communities & being of one accord with our environment & nature. Day 2: Kujichagalia = self-determination; we define ourselves, name ourselves, speak for ourselves & create for ourselves. Day 3: Ujima = collective work and responsibility; we, as an entire community, share the obligation to maintain, nurture and grow our future. Day 4: Ujamaa = cooperative economics; expresses the need for us to support each other’s economic growth & prosperity through contributions of finances, talents, skills, time and labor. Day 5: Nia = purpose; practicing daily these principles guide us in our direction. Day 6: Kuumba = creativity; manifested in our desire to add beauty & originality in all our endeavors and to leave the world we inherited better off for generations to come. Day 7: Imani = faith; what we rely on to get us through the many adversities we face in our families, community & society. 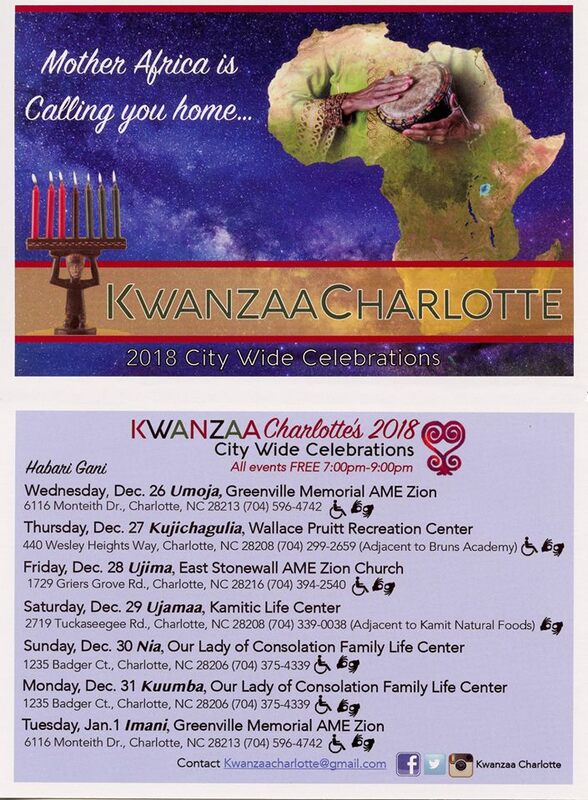 Kwanzaa Charlotte is an annual celebration opened to the entire community. Rooted in collective faith in the righteousness of our struggle, along with work and sacrifice, we will achieve a better condition for our people.